Chrome has taken a turn towards the dark side and has attacked the WordPress admin menu. Luckily there’s a simple workaround and a bug report has been filed which will hopefully lead to a fix soon! The bug is specifically Chrome related (you can read more here) and they are currently working on a fix that should see it’s way into version 46 stable. visit: chrome://flags/#disable-slimming-paint (<< unclickable, you’ll have to enter it yourself :) ) in your browser and select ENABLE (from comment #42). The quickest and easiest solution. Collapse and re-Expand the Admin menu is a temporary fix, as is refreshing the screen, but that’s a PITA. 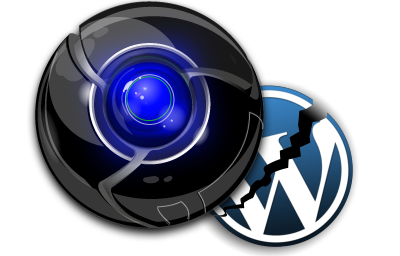 There is also WordPress plugin, and it will ALSO do the trick. I don’t mean to detract from the developer, but I am very anti installing unnecessary plugins if you really don’t need to. But the fact I haven’t provided you a link only means you’ll spend longer looking for it than you would have spent if you just go and change the option in Chrome settings. #3, and #6 really aren’t options. #4 and #5 are workarounds that will only help users who experience the problem with WordPress and no other sites that are also affected (although this does appear to be somewhat limited), leaving #2 (which is also only a WordPress fix) and is way too much overkill. The best solution is #1 and this will take you all of about 5 seconds. It is the BEST solution because this fixes other areas the bug affects (which for me) is my gMail menu where things haven’t been right for a while but a refresh fixed it. In fact, refreshing the page in WordPress also fixes it, as does collapsing and expanding the admin menu.